Sign-in with your email address for member pricing. To set-up/reset your password click "Forgot Password" and follow the instructions. If you have questions about your status, please email membership@calawyersforthearts.org. RSVP by 5/11/10 to be included in the event program. RSVP by 5/11/10 to be included in the event program. Includes 2 tickets to the event. RSVP by 5/11/10 to be included in the event program. Includes 4 tickets to the event. RSVP by 5/11/10 to be included in the event program. Includes 6 tickets to the event. RSVP by 5/11/10 to be included in the event program. Includes 8 tickets to the event. RSVP by 5/11/10 to be included in the event program. Includes 12 tickets to the event. Online registration is now closed. Walk-in registration at the door will be available. 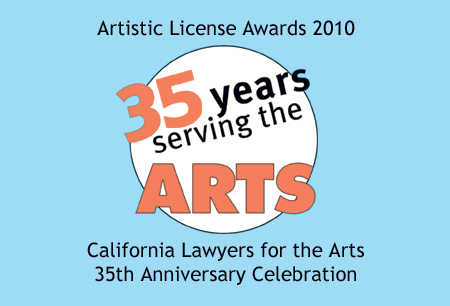 Celebrate our 35th anniversary at the Artistic License Awards benefit events, May 2 in Santa Monica and May 14 in San Francisco. Please visit our online benefit auction. A stay at Cabo Villas beach resort is currently listed! We'll be updating the auction regularly so please check back as well. London Breed, The Honorable Willie L. Brown, Jr.